Today’s challenge was 3 Yellow Gifts of Fresh Mercy. I can find yellow things I’m thankful for, and I know mercies can be new which is like being fresh but… wait, do I truly know what mercy is? Google said this was Merriam Webster but I’m skeptical. Whatev, it’ll do. When you look it up you get a variety of definitions. I’m sick again. I’ve been more sick in the past year than my entire life. I blame preschool and not enough sleep (both reasons are indirect ways of blaming my kids). Sore throat. Like, swollen-tonsils-but-I-don’t-have-tonsils sore. And general achiness that makes me feel like crud. 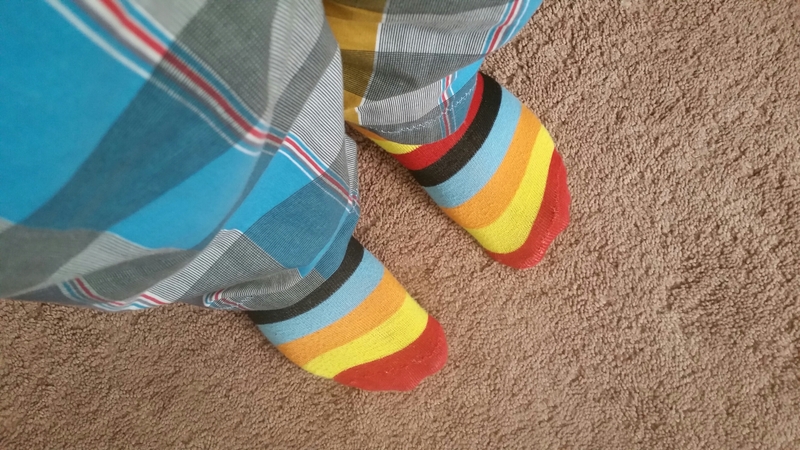 In the past year, I’ve noticed when I don’t feel well, I mix bright patterns and wear bright colors without even realizing I’m doing it (and I also go out in public looking this way, you’re welcome.) And these socks have been missing for months. I just happened to find them today. And I’m cheered a little. This entry was posted in Uncategorized and tagged 1000gifts, clothes, humor, kids, sick. Bookmark the permalink.